An Israeli military officer shot and killed a 19-year-old Palestinian woman at a checkpoint east of Tulkarem on Tuesday, saying that she had attempted to stab him, Israel’s army said. An Israeli army spokesperson said that the officer killed the young woman at a checkpoint near the illegal settlement of Enav east of Tulkarem because she posed an “immediate danger” to him. A spokesperson for the Palestinian Red Crescent said that one of their emergency teams arrived on the scene shortly afterward. She confirmed that the young woman had no vital signs. The team was prevented from taking away her body, which was instead taken away in an Israeli army medical jeep. The Red Crescent initially estimated the woman to be around 15 years old. However, a Palestinian family later identified her from photos circulating social meda as their 19-year-old daughter, Maram Ramiz Hassouna, from Rafidia in Nablus. The family told Ma’an that she had spent a year in Israeli custody after she was charged with attempting to stab an Israeli soldier at the same checkpoint near Enav settlement two years ago. Israeli police said that the area was closed off following the incident. Earlier on Tuesday morning, a 16-year-old Palestinian boy was shot dead by Israeli forces in the illegal Gush Etzion settlement bloc after he allegedly attempted to stab an Israeli settler. No Israelis were wounded by the boy, although Israeli forces wounded an Israeli bystander with bullet shrapnel, the Israeli army said. While Israel alleged many of those were attempting to attack Israelis when they were shot, Palestinians and rights groups have disputed Israel’s version of events in a number of cases. 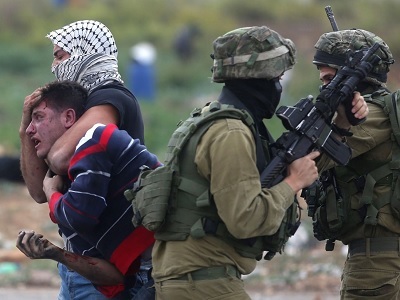 The attacks that have taken place — claiming the lives of 19 Israelis — have been accompanied by a wave of popular unrest that has swept the occupied Palestinian territory and Israel.